• 3 Gray whale watching excursions over 2 days. watching, sand dunes, hands on conservation, sustainable community development, stargazing, beautiful landscapes, gourmet cuisine & fresh seafood, cultural exchange, Magdalena Bay, Baja California Sur, Mexico. • Travelers participating in kayaking must be capable of boarding and exiting kayaks and paddling on open water. Kayaking is an optional activity. Travelers can also ride in support skiff. • Allergies and special dietary needs are to be presented in pre-trip forms. Sea turtle monitoring takes place both during the day and throughout the night. While night monitoring can be an exciting experience, travelers are free to pass the time stargazing or sleeping; the local conservation team will make sure the monitoring happens. 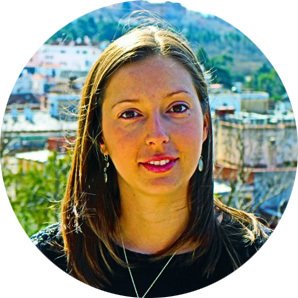 So whether you’re looking to roll up your sleeves and jump right into conservation, or are content lying on the shell beach daydreaming, this trip will accommodate you. It’s your adventure. Departure city: The trip begins and ends in La Paz. Transportation arrangements from Los Cabos or Loreto are available upon request. Trip Fees: USD $1,550 per person, based on double occupancy, Add USD $150.00 for single occupancy. Kids under 11 are entitled to 30% discount with paid adult. Includes: 3 gray whale watching excursions. Genuine cultural exchange with guides and hosts from local fisher community. Ground transportation from La Paz to Magdalena Bay and back (about 3 hours each way), boat transportation to camp and back, regional cuisine with gourmet flair (all meals starting on lunch of day one and ending on lunch of day 5, drinks including wine and beer), taxes, comfortable upgraded camping accommodations with spacious tents, mattresses and bedding. 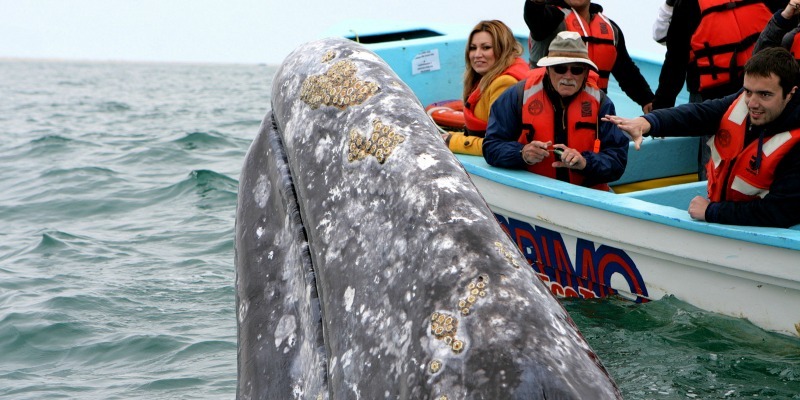 Trip details: Travel to Baja’s breath-taking Magdalena Bay on the Pacific, where hundreds of gray whales migrate to breed. 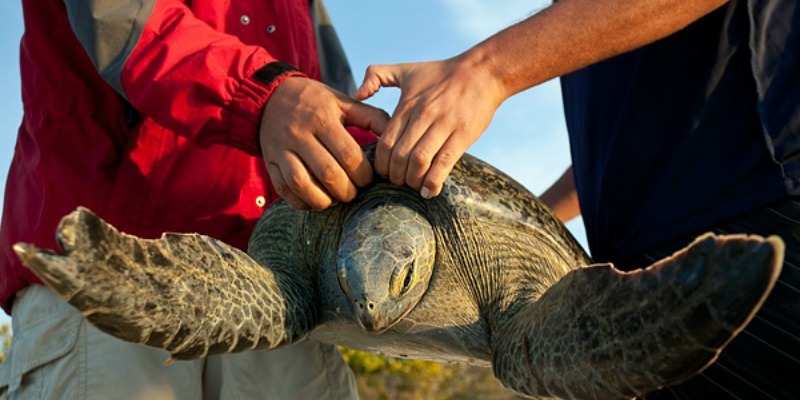 Sea turtle monitoring takes place over a period of 24 hours. During this time, teams of 2 fishermen and 2-4 travelers will check the nets every 2 hours. Turtles caught during daylight are measured, tagged, and released back into the water. Turtles captured at night are released early in the morning. While monitoring at night and early morning produces unforgettable experiences, travelers are free to pass their time sleeping, stargazing, or as they see fit. 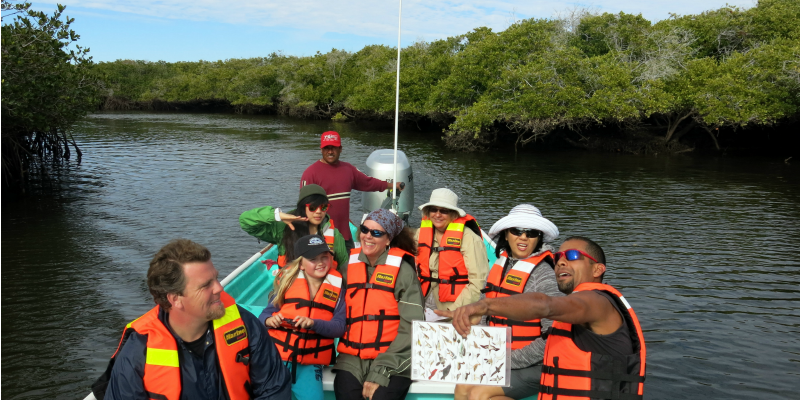 Travelers will have time to participate in other activities such as sea kayaking, mangrove snorkeling, bird watching, nocturnal dune hiking, island exploration, guided constellation identification, discussions about conservation and ecology, guided exploration of Magdalena Bay and local flora and fauna, paddles through mangrove canals and observation of traditional fishing techniques. Day 1 La Paz – Magdalena Bay. cuisine with gourmet flair. 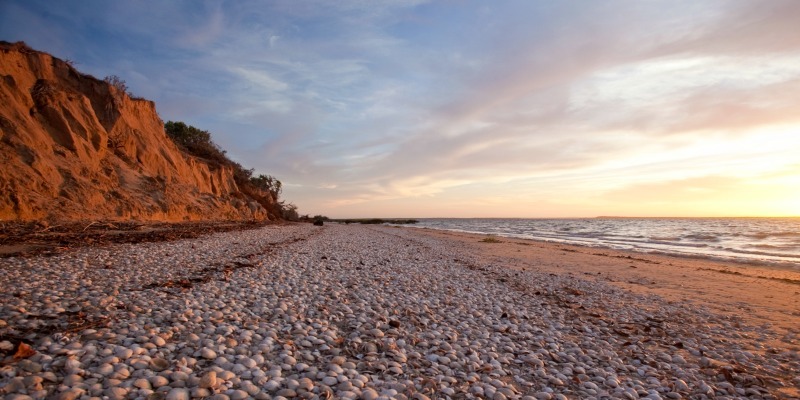 Settle into your camp on a secluded island and learn about the in-water sea turtle monitoring during happy hour. 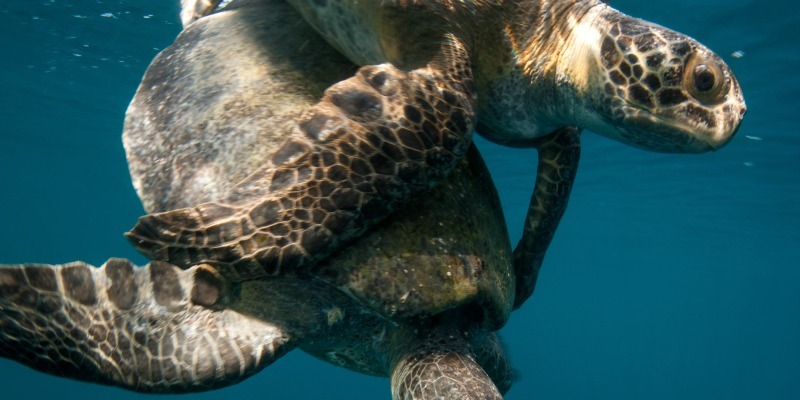 Take part in a sea turtle monitoring project recognized around the world as a model for community based conservation. Help fishermen set nets and check them in the channel. Captured turtles are weighed, measured, tagged and released. Or relax, and watch the birds, marine mammals and other natural wonders that surround the island. 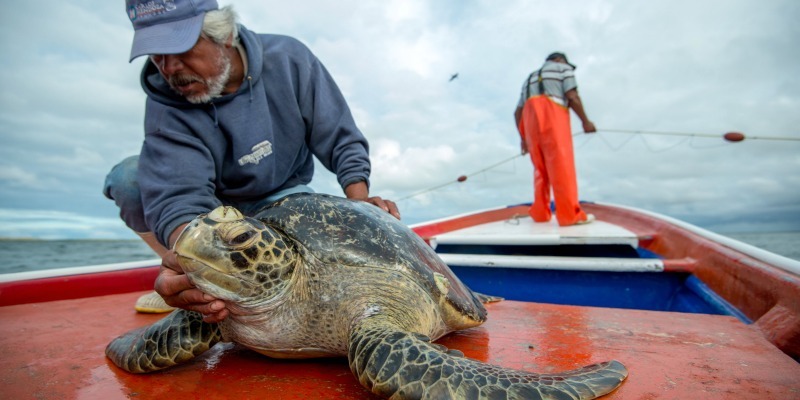 Learn about sea turtle biology, their important ecological function, the threats they face and the crucial role your fisher guides play in their preservation by combining tourism and conservation. Head down to the beach to finish measuring and weighing sea turtles before releasing them back into the wild. 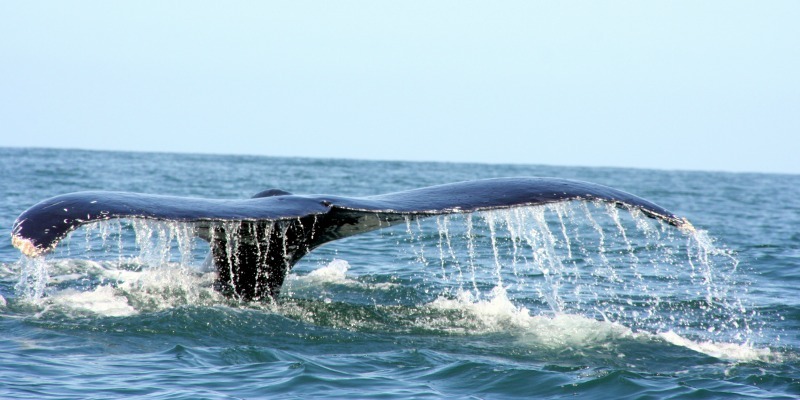 After an orientation on gray whales, their incredible migration, and the importance of Magdalena Bay for breeding and calving, head out on the water to search for these magnificent creatures. Head out again to search for whales followed by a picnic lunch before crossing the dunes to the Pacific Ocean. En route to your afternoonwhale watching session, visit with local fishermen to see what they are catching and learn about local fishing techniques. 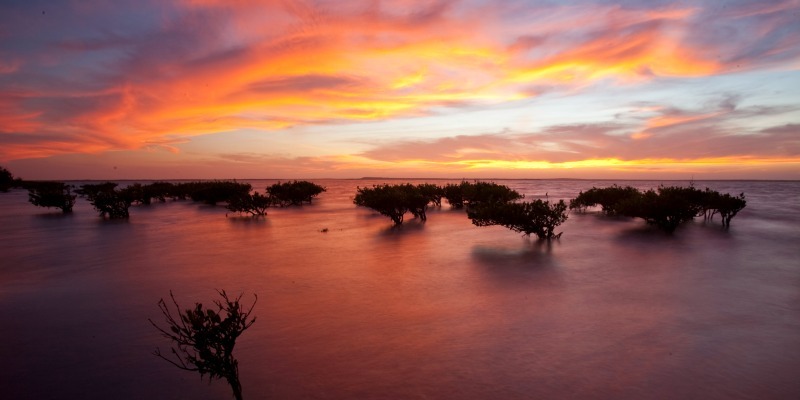 Back at camp, you can relax or take a leisurely kayak paddle through the mangrove canals. Enjoy a relaxed morning in camp before bidding farewell to your hosts and travelling back to La Paz. The photographs, stories, and memories you keep will tell the tale of the adventure of a lifetime. Comfortable camping accommodation. Tents are equipped with either two singles or one double mattress with linens and pillows. Toilet and shower facilities are environmentally friendly and integrated in the landscape. Our base camp is situated on Magdalena Island and is accessed and supplied by outboard skiff. With this in mind, we have designed the camp to blend safety, sustainability and comfort. Our spacious tents are situate among the sand dunes, and provide stunning views of natural land and seascapes as well as local wildlife. Leave your travel pillow at home, as all tents are outfitted with mattresses, linens and blankets. Towels are provided, and our bathrooms and shower are integrated into the landscape. As we are located in a remote and arid environment we ask that guests respect the surrounding habitat and use water wisely. RED’s friendly local staff is anxious to make your experience as enjoyable as possible, and our WFR certified guides are equipped to attend to any medical emergency. Our chefs are happy to welcome you into the kitchen to show off their unique blend of regional cuisine with gourmet flair.